Literate. Visceral. Affecting. Theatre that is experienced—not simply seen. Call 919.834.4001 for Tickets $25 for full 3 play performance (Oedipus, Oedipus at Colonus, Antigone) or $10 per play if you want to attend each one-hour play on a separate date. 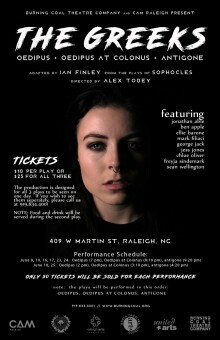 Burning Coal Theatre Company and Contemporary Art Museum Raleigh will collaborate on a production of The Greeks, adapted by Ian Finley from the plays of Sophocles (Oedipus, Oedipus at Colonus and Antigone) June 9 – 25, 2017 at CAM Raleigh, 409 West Martin Street, Warehouse District, Raleigh. The play will be performed throughout the galleries and run June 9 – 10, 16-17 and 23-24 at 7 pm and June 18 & 25 at 2 pm. The three one-hour plays are designed to be seen together over the course of a single evening (tickets $25), but can also be viewed separately on different dates if desired (tickets to each $10). Student Rush tickets at curtain time, if available, are $5 for the three play viewing. There is no performance on Sunday, June 11th. For tickets, please call us at 919.834.4001. Each play is approximately one hour long with a 10 minute intermission to follow. 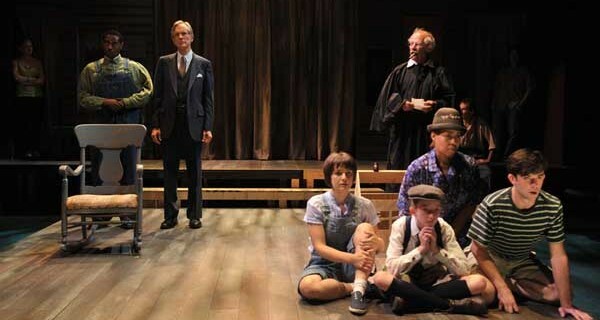 Please visit www.burningcoal.org for information about ASL and audio described performances. NOTE: Food will be served during the second play. Sophocles wrote Oedipus, Oedipus at Colonus and Antigone in the 5th century BC (about 2500 years ago). The plays have been produced regularly since then. They were written as part of the Festival of Dionysus which itself was a religious ceremony that morphed over the years into something like what we think of as theatre today, when Thespis stepped from the Chorus and “performed” a role for the first time (that we know of) in human history. Athens was then a ‘City-State’ with the most powerful army and navy in the world and it dominated the known world. Sophocles plays are extraordinary in that they challenged the accepted religious dogma and the supremacy of the State. In short, they were radical to the max! Originally from the mining town of Price, Utah, Ian Finley received his undergraduate degree in theatre from the University of Utah and his MFA from NYU (in playwriting). From graduate school, he moved to Raleigh and spent nine years developing Burning Coal Theatre Company’s education program, WillPower. His plays have been produced in several states and have been published. For Burning Coal he has written the book to Jude the Obscure, Parts 1 & 2 and 1960. The cast of The Greeks will include Jonathan Able, Mark Filiaci (Enron), Ben Apple (Rum & Vodka), Ellie Barone, George Jack (Hysteria), Jess Jones (Civil Rights Through Song), Chloe Oliver (Hair), Freyja Sindemark and Sean Wellington (Written on the Heart). Estimated run time: 3 hours. Get A License Plate That Shows You Support the Arts! & independent supporters like you!